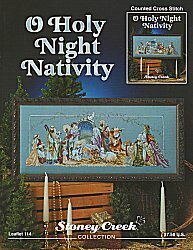 Rich in detail and color, this exquisite O Holy Night Nativity scene will be a cherished Christmas heirloom for generations to come. Chart only. Our model was stitched on a 1/2 yard cut of 28 ct blue wing Jobelan over 2 threads for a finished design size of approximately 25 1/4"w x 9 1/4"h (352w x 130h Stitches). Specialty threads used included DMC ecru Pearl Cotton #8 and GlissenGloss 000 bright white, 407 brass and 605 brick red Rainbow Blending threads. It is embellished with Mill Hill 40123 cream, 42012 royal plum and 42014 black Petite Glass Beads. Fabric, threads and embellishments sold separately.